Mary Lou McDonald attending the Ireland Funds dinner in Washington DC last year. 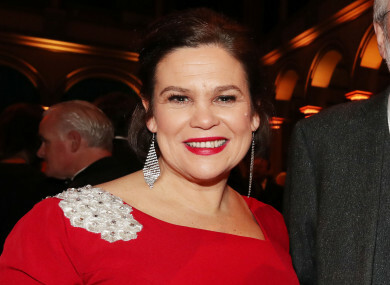 AFTER GETTING SNUBBED last year, Sinn Féin leader Mary Lou McDonald will attend the White House St Patrick’s Day event hosted by US President Donald Trump this year. Last year there was some controversy after McDonald and DUP Leader Arlene Foster were not invited to the White House for the traditional St Patrick’s Day reception. However, former Sinn Féin president Gerry Adams and DUP MP Ian Paisley Jr were both invited. It has long been tradition for the leader of Sinn Féin to attend, however, the leader of the party had always been Gerry Adams. Speaking in Washington DC last year, McDonald told TheJournal.ie she was not concerned about being left out of the celebrations, adding that the White House was justified in inviting Adams. “I don’t feel that I was snubbed, it is a matter for the White House who they invite as their guests,” she said at the time. However, this year, the Sinn Féin leader has got the nod. McDonald will travel to New York and Washington to brief political leaders with Irish- American interests, and will meet a cross-section of Congress members in the Friends of Ireland Caucus and officials in the US Administration. McDonald will also attend the Speakers Lunch on Capitol Hill, which Trump will also attend, along with Taoiseach Leo Varadkar. In addition, Mary Lou McDonald will meet with leaders of the trade union movement and other Irish American leaders. McDonald has had a few run ins with the White House over the years. In an interview with this website last year, she recalled that she has only attended the White House on one previous occasion – the year that Adams was not allowed in. “We waited and waited. We met everybody on the way in, I was saying, ‘Hello congressman, hello senator.’ It was nearly finished, so Gerry said, ‘For the love of God, just go.’ I said: ‘Are you sure?’ He said yes. I walked off and I had literally taken three steps away and I heard him whisper: ‘Traitor.’ I didn’t live that one down, I was the deserter, I left him to fend for himself,” she said, jokingly. Email “Mary Lou to attend White House St Patrick's Day event after getting snubbed last year ”. Feedback on “Mary Lou to attend White House St Patrick's Day event after getting snubbed last year ”.